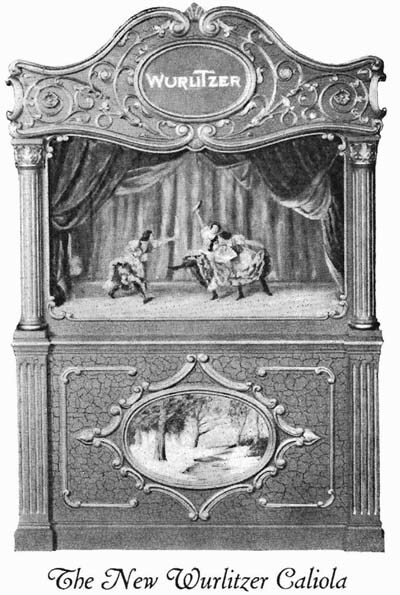 Edited and Converted to HTML by David Back, August and December 2012.
by THE RUDOLPH WURLITZER MFG. CO.
Where Wurlitzer Band Organs are Built. 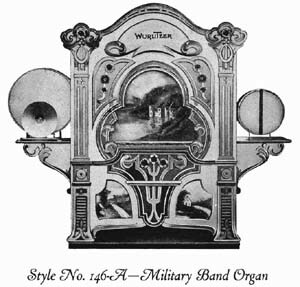 WURLITZER MILITARY BAND ORGANS produce lively, enjoyable music of such great volume that they are sure to attract crowds. Built by Wurlitzer, who are renowned throughout the world as the foremost manufacturers of musical instruments, you are assured absolute dependability, and the latest improved features. The variety of selections is greater; the tone quality is superior, and the instrumentation harmonizes and keeps perfect time. 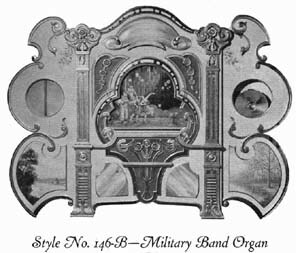 Wurlitzer Military Band Organs will create and maintain a splendid income. 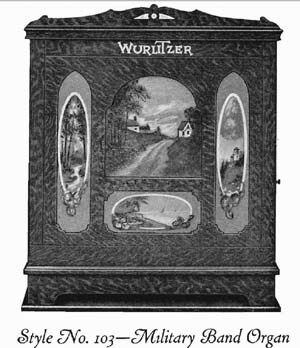 Many owners of Wurlitzer organs have become independently wealthy. The saving on music, and the increase in patronage should pay for the instrument in a short time, and then yield a handsome profit. You have no orchestra or band problems to worry about. Just press a button, and the instrument becomes your willing servant. You can start early, please your crowd by playing longer numbers, and instead of paying out most of your profit for music, you can save it. 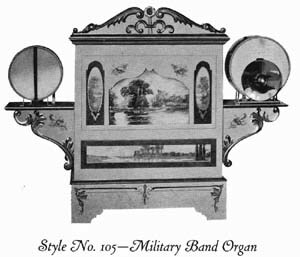 A Wurlitzer Military Band never" gets tired," and responds to your instant command. Wurlitzer Music Rolls are cut correctly, and come in all the latest popular and standard selections. By using a paper roll system, we cut the music and reproduce it exactly as originally arranged, giving it the same snap and swing that the composer intended. 41 Keys, Played by (125 style) paper music rolls. Designed especially for Miniature Carouselles, Kiddie Swings and other children's amusements. Just the size organ for a Pit Show. An all-wood trumpet organ which holds its tone well and is not affected by sudden temperature changes. 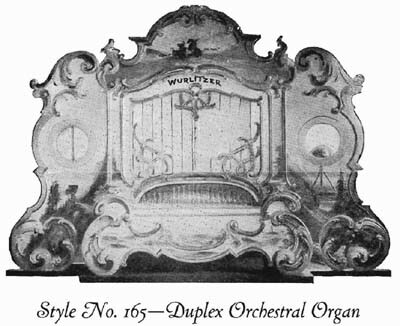 The organ is small, but very compact, and has exceptional volume for its size. It is easily transported when packed, and two men can easily carry the instrument about. Built in an Oak Veneered Case, finished light Fumed Oak or Golden Oak. Paneled front handsomely decorated with landscapes or flower designs. A very attractive little organ. Plays Style No. 125 long tune paper rolls, and contains all the late improvements we have incorporated in the larger organs. HEIGHT, 3 feet 6 inches. WIDTH,3 feet 2 inches. DEPTH, 2 feet I inch (including crankshaft extension). WEIGHT, NET, 235 Ibs. ; PACKED, 375 lbs. Played by (125 style) paper music rolls. This particular style Wurlitzer Military Band Organ has 44 keys, insuring a wide range of melody. OUTSIDE VISIBLE- 2 Drums and Cymbal mounted on brackets. 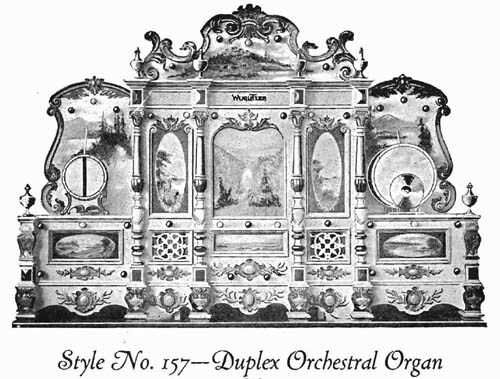 INSIDE- 14 Wooden Piccolos; 14 Wooden Flageolets; 5 Open Basses; 14 Violin Pipes "Melody; 13 Wooden Trumpets; 9 Open Pipes in Accompaniment; 6 Stopped Pipes in Melody. BOTTOM- 5 Stopped Basses; 9 Stopped Accompaniment; 8 Stopped Melody. FIVE Stops- 1 for Piccolos; 1 for Flageolets; 1 for Accompaniment; 1 for Melody and 1 for Trumpets. HEIGHT, 4 feet 10 inches to top of scroll. WIDTH, 6 feet 6 inches. DEPTH, 2 feet 4 inches. SHIPPING WEIGHT, 550 lbs. Same instrumentation as Style No. 105, less Drums and Cymbal. HEIGHT. 4 feet 1 inch. WIDTH, 3 feet 6 inches. DEPTH, 2 feet 4 inches. Case is made of Golden Oak. SHIPPING WEIGHT, 500 Ibs. This beautiful instrument is made with 44 keys. Built in Oak Veneered Case, fancy white enamel carved front, decorated with hand painted panels. Top Scroll hinged to top of organ. OUTSIDE, VISIBLE- 2 Drums and Cymbal, with demountable Wings. 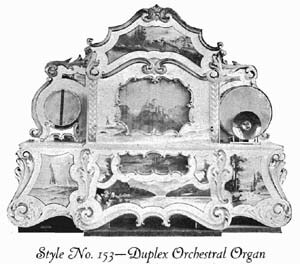 INSIDE- 14 Wooden Piccolos; 14 Flageolets; 5 Open Basses; 14 Violin Pipes Melody; 13 Wooden Trumpets; 9 Open Pipes, in Accompaniment; 6 Stopped Pipes, in Melody. FIVE Stops-1 for Piccolos; 1 for Flageolets; 1 for Accompaniment; 1 for Melody and 1 for Trumpets. HEIGHT, to top of Scroll, 5 feet 7 inches. HEIGHT, with Scroll down, 4 feet 4 inches. WIDTH, with Wings, 7 feet 3 inches. WIDTH, without Wings, 3 feet 7 inches. DEPTH, 2 feet 6 inches. WEIGHT, 600 lbs. 44 Keys, Played by (125 style) paper music rolls. Especially designed for small to medium size rinks. OUTSIDE, VISIBLE- 13 Brass Trumpets; 13 Brass Piccolos; 13 Wooden Flageolets; 2 Drums; Cymbal. INSIDE- 5 Wooden Trombones; 5 Open Basses; 13 Open Pipes; 6 Stopped Pipes; 11 Pipes in Accompaniment. 1 Stop for Trumpets; 1 Stop for Trombones; 1 Stop for Piccolos; 1 Stop for Flageolets. Bass Drum, Snare Drum and Cymbal. HEIGHT, 6 feet 3 inches. WIDTH, 6 feet 7 inches. DEPTH, 2 feet 3 1/2 inches. SHIPPING WEIGHT, 800 lbs. 51 Keys, Played by (150 style) paper music rolls. Built in Oak Veneered Case, finished natural, with fancy white enameled carved front decorated with gold leaf, colors and beautiful landscapes. 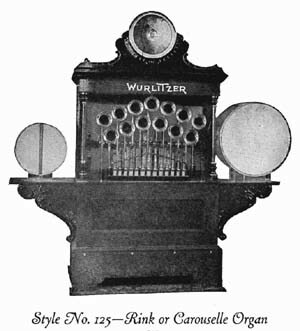 This instrument is equipped with the long tune Tracker Frame. Drums are fastened on demountable brackets. These may be detached and packed for shipment. Top Scroll is hinged to top of Organ. 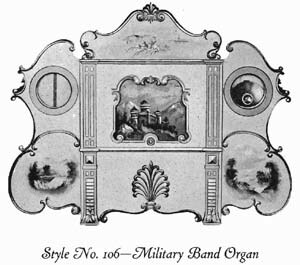 BOTTOM- 3 Open Basses; 9 Stopped Pipes; 16 Stopped Melody Pipes. DRAW STOPS- 1 for Trumpets; 1 for Flute and 1 for Violin. HEIGHT, 6 feet to top of Scroll, 5 feet with Scroll turned down. WIDTH with Drums, 7 feet 2 inches, without Drums 4 feet 4 inches. DEPTH, 2 feet 4 inches. WEIGHT, packed for shipment, 850 lbs. 49 Keys, Played by (150 style) paper music rolls. Built in Oak Veneered Case, fancy white enamel carved front decorated with gold leaf and colors and hand painted panels. OUTSIDE, VISIBLE- Latest improved Bass and Snare Drum with spring tension and nickel-plated Cymbal. INSIDE- 3 Wooden Trombones; 3 Octave Stopped Basses; 15 Wooden Trumpets; 15 Stopped Flute Pipes; 16 Violin Pipes; 9 Open Pipes; 16 Open Flute Pipes. BOTTOM- 3 Open Bass Pipes; 9 Stopped Accompaniment Pipes; 16 Stopped Melody. Stops- 1 for Trumpets; 1 for Stopped Flute and 1 for Inside Violin. HEIGHT to top of Scroll, 6 feet 1 inch. HEIGHT with Scroll down. 5 feet 4 inches. WIDTH, with Drums. 7 feet 2 inches, without Drums, 4 feet 3 inches. DEPTH, 2 feet 5 1/2 inches. WEIGHT, packed for shipment, 900 lbs. Regularly equipped with our long tune Tracker Frame. Wings of three-ply veneered stock, light weight, very strong and will not warp out of shape. Wings arranged to hook to sides of organ case. Easily detached and packed for shipment. OUTSIDE, VISIBLE- Latest improved Bass and Snare Drum with spring tension rods. Rust-proof finish and nickel-plated Cymbal. lNSIDE- 16 Octave Violin Pipes; 3 Wooden Trombones; 3 Octave Stopped Bass Pipes; 15 Wooden Trumpets; 15 Stopped Flute Pipes; 16 Violin Pipes; 9 Open Pipes. BOTTOM- 3 Open Bass Pipes; 9 Stopped Accompaniment Pipes; 16 Stopped Melody Pipes. BELLS- 6 heavily nickeled Bell Bars, playing from music roll. Draw Stops, for Trumpets, Stopped Flutes and Inside Violins. HEIGHT to top of Scroll, 6 feet 1 inch. HEIGHT with Scroll down, 5 feet 4 inches. WIDTH, with Wings, 8 feet 1 inch. WIDTH, without Wings, 4 feet 3 inches. DEPTH, 2 feet 5 inches SHIPPING WEIGHT, 950 lbs. This style is one of our best sellers, being just right in size and volume for the average sized rink. It is equal to a band of from seven to ten pieces and will amply fill a rink with a floor space of from 8,000 to 10,000 square feet. The CASE is very handsome in appearance and is made of quarter sawed Oak-either Golden or Weathered. OUTSIDE, VISIBLE- 3 Heavy Brass Trombones; 15 Brass Trumpets; 16 Brass Clarionets; 16 Brass Piccolos. BOTTOM- 28 Stopped Pipes. Bass and Snare Drums; Cymbals. STOPS- 1 for Clarionets; 1 for Trumpets; 1 for Violin; 1 for Stopped Diapason. HEIGHT, including Cymbals, 7 feet 5 inches. WIDTH, including Drums, 7 feet 2 inches. DEPTH, 2 feet 10 inches. WEIGHT, GROSS, 1,050 lbs. ; TARE, 450 lbs. ; NET, 600 lbs. For Three-Abreast Carouselles and Open-Air Dance Pavilions. 54 Keys with duplex (150 style) long roll Tracker Frames, latest drums with self tightening tension rods. Oak Veneered Case; natural finish; fancy white enamel front; hand-carved scroll work in gold leaf and colors. Raised panels decorated with landscape and flowered designs. BASSES-3 Wooden Trombones; 3 eight-foot Stopped Diapason Pipes; 3 fourfoot Open Diapason Pipes; 3 two-foot Stopped Diapason Pipes. ACCOMPANIMENT-9 Stopped Flute Pipes; 18 Violin Pipes. MELODY-16 Stopped Flute; 16 Octave Violin; 15 Wooden Trumpets; 15 Cello Pipes; 32 Violin; 16 Open Flute; 15 Stopped Pipes; 16 Bell Bars. TRAPS-Bass Drum; Snare Drum and Cymbal. AUTOMATIC Stops--1 for Octave Violin; 1 for Open Flute; 1 for Cello Pipes; 1 for Stopped Pipes; 1 for Bell Bars; 1 for Swell Shutters. HEIGHT, with front, 7 feet I inch; without front. 5 feet 2 inches. WIDTH. with front. 8 feet 8 inches; without front. 4 feet 2 1/2 inches. DEPTH. with front, 3 feet 8 inches; without front. 2 feet 7 1/2 inches. WEIGHT. packed for shipment, 1,300 lbs. Built in Oak Veneered Case, natural finish. Beautiful white enameled front, elaborately carved and decorated with gold leaf and colors. Panels and screen over swell shutters beautifully decorated with realistic landscapes. 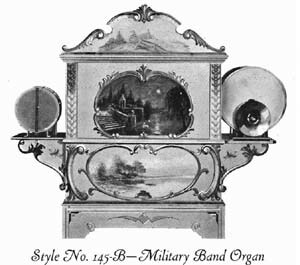 To further set off the organ, the decorative front is wired for thirty-four 16 C. P. lamps, with an additional red lamp in each drum. These lights are usually furnished in red, white and blue colors, and the organ makes a wonderful- display at night. Equipped with Duplex Tracker Frame to Play same Rolls as Style 165 Organ. BASS-6 Wood Trombones; 6 Stopped Diapason Pipes; 6 Stopped Octave Diapason Pipes. ACCOMPANIMENTS-10 Stopped Flute Pipes; 10 Open Flute Pipes; 10 Open Piccolo Pipes. MELODY-44 Violin Pipes; 22 Octave Violin Pipes; 22 Piccolo Pipes; 22 Open Flute Pipes; 22 Stopped Flute Pipes; 16 Bell Bars. TRUMPETS-14 Wood Trumpets; 14 Wood Clarionets. TRAPs-Bass Drum (automatic tension); Snare Drum; Cymbal. AUTOMATIC STops-l for Bells; 1 for Swell and Wood Trombones. DRAW STops-1 for Wood Trombones; 1 for Wood Trumpets; 1 for Violins; 1 for Flutes; 1 for Piccolos. HEIGHT, 8 feet 4 1/2 inches. WIDTH, 12 feet 2 inches. DEPTH, 3 feet 10 inches. WEIGHT, packed for-shipment, 1,900 lbs. Equipped with drums on brackets on side of case easily detached. Drums can also be put on top of the organ if desired. 8 Draw Stops for-Trombones, Trumpets, Clarionets, Piccolos, Cello, Flute and two Violins. 1 Automatic Stop for Glockenspiel. BASS-6 eight-foot Stopped Diapason Pipes; 6 four-foot Open Diapason Pipes, 6 Brass Trombone Pipes. ACCOMPANIMENT 10 eight-foot Stopped Diapason Pipes; 10 four-foot Open Diapason Pipes; 10 four-foot Stopped Diapason Pipes; 20 two-foot Violin Diapason Pipes. TRUMPETS-14 Brass Trumpets, 14 Wood Trumpets. 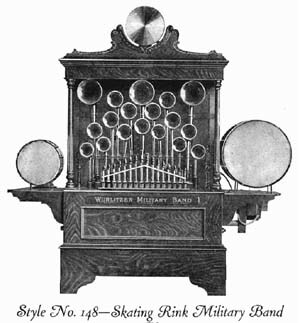 MELODY-22 Brass Clarionette; 22 Brass Piccolos; 22 four-foot Cello Pipes; 44 two-foot Violin Pipes; 22 four-foot Stopped Flutes; 22 two-foot Stopped Flutes; 22 Flageojets; 22 Flutes, 22 Octave Violin, 22 Glockenspiel. HEIGHT, when assembled, 8 feet 1 inch. WIDTH, when assembled, 11 feet. DEPTH, when assembled, 4 feet. WEIGHT, when packed, 3,000 lbs. 69 Keys, For largest type stationary Carouselles, Roller Coasters and other Park installations. Used with great success in Park Dance Pavilions. Case, Oak Veneered; finished natural, with highly decorated white enamel fancy front; wings detachable. Equipped with Duplex Tracker Frame. Automatic rewind; stops off and cut-off for drums. BASSES-6 eight-foot Stopped Pipes; 6 eight-foot Open Pipes; 6 Wood Trombones. ACCOMPANIMENT-1O Stopped Pipes; 10 Open Pipes. MELODY-14 Wood Trumpets; 14 Wood Bassoons; 14 Wood Viola Pipes; 22 Flute Pipes; 22 Piccolo Pipes; 22 Flageolet Pipes; 22 Open Piccolos; 22 Loud Violin; 22 Soft Violin; 22 Bells. TRAPs-Bass Drum; Cymbal; Crash Cymbal; Triangle; Snare Drum; Castanets. AUTOMATIC STops-1 for Trombone; 1 for Trumpets; 1 for Bells; 1 for Flute and Piccolo; 1 for Flageolet and Open Piccolo; 1 for Loud Violin; 1 for Soft Violin. DIMENSIONS WITH FRONT ON-HEIGHT. 8 feet 5 inches. WIDTH, 12 feet 8 inches. DEPTH., 4 feet 4 inches. DIMENSIONS WITHOUT FRONT ON -HEIGHT, 5 feet 10 1/2 inches. WIDTH. 6 feet 5 inches. DEPTH, 3 feet. WEIGHT, packed for shipment, 3,000 lbs. 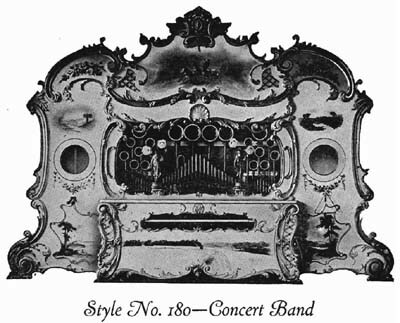 In introducing the Style 180 Organ, we have endeavored to produce an instrument that will give satisfactory results in the way of automatic band music for the largest skating rinks built. The case design is similar to the cut shown above. The front is finished in white enamel, the hand-carved scroll-work decorated with colors and shaded bronzes. The raised panels beautifully decorated with landscapes or flower designs. The case is finished in light Golden Oak. The instrument has the Duplex Tracker Frame, which is driven separately by a 1/8 H.P. electric motor. This motor is operated by a remote control switch, so that the music can be cut off at any time without shutting off the power on the Blower line. This switch can be placed anywhere desired. It is impossible to build Bellows strong enough to supply the wind for an instrument of this type. The suction and pressure is supplied by a specially constructed steel Blower, driven by a 3 H.P. electric motor which operates at 3,500 R.P.M. Playing notes, 88, with 36 additional notes controlled by couplers. 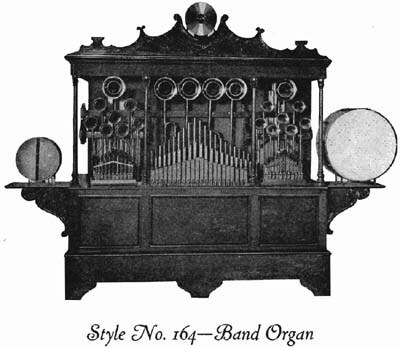 Organ has 7 draw stops by means of which different combinations can be set to play, and the volume cut down and the tone of the organ softened, if desired. HEIGHT, 7 feet 1 inch. LENGTH, 10 feet 7 inches. DEPTH, 4 feet 3 1/2 inches. HEIGHT, 10 feet 8 inches. LENGTH, 18 feet 8 inches. DEPTH, 5 feet. Tracker Frame Motor, 1/8 HP., 1,150 R.P.M. connected direct to Tracker Frame, by means of worm gear drive. Blower Motor, 3 H.P., 3,500 R.P.M. connected direct to steel Orgoblo supplying 75 cubic feet vacuum at 32 inches, and 300 cubic feet pressure at 12 inches. For Amusement Parks, Rinks, Carouselles, Circus Riding Devices and Outdoor Advertising. Just the instrument enterprising amusement interests have been looking forward to for years-something to attract the crowds-an entirely new musical instrument with a beautiful tone and remarkable volume. It plays from rolls or may be played by hand, creating beautiful musical effects. No class of amusement can afford to overlook this opportunity, as it is ideal for Circuses, Parks, Rinks, Riding Devices-in fact every amusement. As an outdoor advertising feature for Truck, Show Wagon or Ballyhoo Platform, there is no other instrument comparable to this New Wurlitzer Caliola. 44-note Flute Pipes, either Wood or Brass. 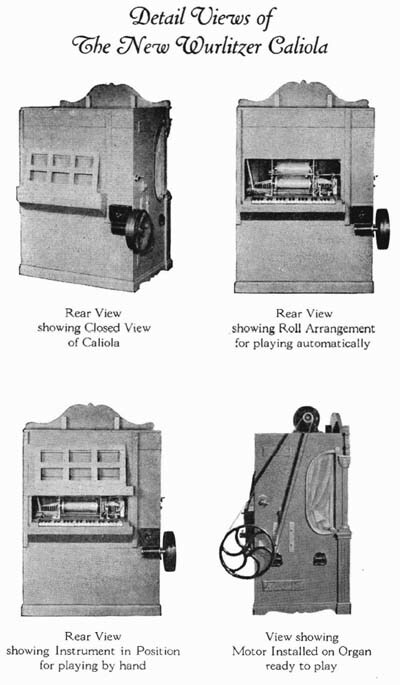 Equipped with or without Keyboard Plays ten-tune 65-note, Automatic Player Piano Roll. Operated by 1/4 H.P. Electric motor or 1 1/2 H.P. Gas Engine. Worm Drive Countershaft attached to case. Equipped with loud or soft volume control. Instrument can be furnished with Bass and Snare Drums at an additional charge. HEIGHT TO Top OF SCROLL, 5 feet, 4 inches. HEIGHT WITHOUT ScROLL, 4 feet, 8 inches. WIDTH, 3 feet, 7 1/2 inches. DEPTH,2 feet, 10 inches. WEIGHT, 435 Ibs. with countershaft and drive wheel. FINISH-Red or Green Crackle Lacquer with carvings in Gold. Hand Painted Picture on Panel and Screens. This Shaft Drive Transmission is just what you have been wanting on your organ for years. Taking the transmission used on our Duplex Tracker Frame as a basis, we have developed a strongly built shaft transmission that we are certain will completely eliminate all troubles with the driving of the Tracker Frame. On the Steel Crank Shaft we use a split steel gear which meshes into a steel pinion on the upright shaft. These mesh perfectly and are practically noiseless. At the top of the upright shaft we have a heavy brass gear working into a pinion of the same material, making a quiet transmission. The coupling shaft is of cold rolled steel with a patent universal coupling, made especially for this transmission, at each end, insuring a steady even drive at all times. Our improved Pneumatic Rewind and Drive device is a positive rewind. It eliminates all the levers and adjustments formerly necessary on the device used to shift the frictions from play to rewind position. On this new windchest each complete valve is built into an individual unit block. Each unit valve block is held to the channel board of the chest by two screws. Compression springs keep these screws tight and the constant pressure takes up any shrinkage. To remove the valve to clean or adjust it, simply loosen up the two screws. Be sure to draw them tight again when replacing them. The motion of each valve is adjusted to the thousandth of an inch, and should require no readjustment. Experience taught us that the cast-iron crank shaft could not be depended upon. Rough handling in shipping often caused breakage, completely disabling the organ. As a result, we have substituted the steel crank shaft. This is a much more expensive shaft, but it gives service. We are now using tin composition metal tubing, from the tracker bar to the tube strip on the windchest. This tubing will last for years, and removes any possibility of trouble with the tracker bar tubing. Our organs are so constructed that the main or Pressure Bellows can be removed in a few moments' time, if in need of repairs. Loosen the pump sticks, take out a screw here and there, remove the wedges and slip the bellows out. No need to dismantle the whole organ. In addition to the improvements mentioned in the previous paragraphs, we have perfected a Snare Drum Action which operates entirely from the suction. This action does away with the belts, pulleys and cogs formerly used. It is a positive action, with much quicker repetition and snappier action. To remove the Snare Drum from the side of the organ, simply pull off the half-inch rubber tube and lift off the bracket on which the drum is mounted. We are also equipping all our organs with a solid platform underneath. This is a big improvement over the old construction. This platform protects the bottom pipes of the organ when moving from place to place, and helps to keep them dry. Drums, equipped with the latest improved automatic spring tension rods, which keep the drum heads always at the proper tension. This feature alone is invaluable when the instruments are used for rink or carouselle purposes where the drum heads are exposed to the constant change of temperature. Our Long Tune Weather-Proof Music Rolls have revolutionized Band Organ construction. Arranged by the best artists obtainable and cut on specially treated weather-proof paper made especially for this use, these rolls play an important part in demonstrating the musical qualities of the Band Organ. No organ can give its best service without the latest and best music. Not only must the music be new but, the rolls must be strong and durable, made to stand long usage and temperature changes. Wurlitzer Long Tune Rolls meet these requirements completely.